Buying a home that needs some tender love and care can be a good choice. Five important steps on how a FHA 203k loan works. 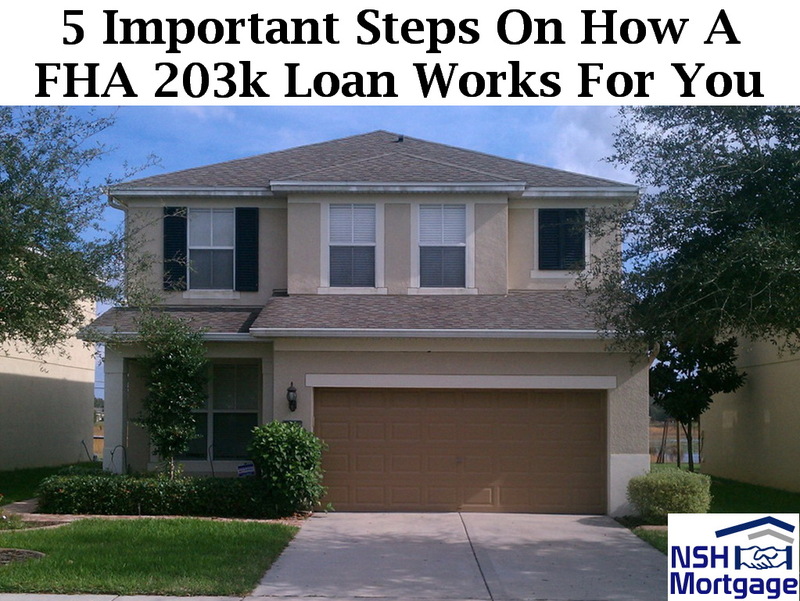 NSH Mortgage has the knowledge and tools that can help you discover how a FHA 203k loan works and on how it can potentially help you on your finances with your FHA loan. Imperfect homes come with less competition from other buyers, and you can build tens of thousands of dollars in additional equity in a short time by making relatively minor improvements. But there is a reason not as many people want to buy a fixer. It does take more work, planning, and time compared to buying your standard turn key home. A FHA 203k loan, sometimes called a Rehab Loan or FHA Construction loan. Which allows you to finance not one, but two major items: the house itself and the needed or wanted repairs. Because the lender tracks and verifies repairs, it is willing to approve a loan on a home it would not otherwise consider. The loan addresses a common problem when buying a fixer home: lenders often do not approve loans for homes in need of major repairs. A home must meet certain safety and livability standards. Some home buyers are handy enough to buy the house and fix it up themselves. But, if the home is too run down, you cannot get a loan in the first place. The 203k lets you buy and fix up a house in one transaction, allowing the lender to approve the loan despite its initial condition. Receiving a final approval involves lining up contractors and receiving bids, and some additional hoops to jump through. Do not get stressed at this process, though. The 203k lender will drive the process and guide you through. You are not on your own! 1. Choose your projects: The first step is deciding which repairs you want to do. The lenders will request any safety or health hazards to be addressed first things like mold, broken windows, lead based paint, and missing handrails. 2. Choose your contractors: Once you have got your project list together, find contractors. The contractors must be licensed and insured, and typically have to be in full-time business. No buddies who do construction on the side, and you typically cannot do the work yourself unless you are a contractor by profession. Best results will come from super experienced and professional remodeling firms that have done at least one 203k renovation in the past. In addition, always remember: your entire project can be held up by one contractor that is unwilling to complete the necessary forms. You might even go so far as to write the 203k paperwork requirements into the contractor agreement. 3. Get your bids: Once your contractor is on board with helping you complete your loan, get official bids. Make sure the bids are not guesses. They must be completely accurate. The reason is that the lender will submit final bids to the appraiser, who builds the value of the work into the future value of the property, on which your loan is based. 4. Submit everything to the lender: By this point, the lender will have your income, asset, and credit report information. Once it has all the required bid paperwork, finally, then your loan can now move onto its final approval step. 5. Close the loan: You will sign final documents, and the house is officially yours. 6. The contractor starts work: Once the loan is completed, the contractors can complete the work. Depending on the extent of the repairs, you may be able to move in at the same time. For bigger projects, arrange to live somewhere else until work is complete. You can finance up to six months of payments for the new mortgage to allow room in your budget to do so. 7. Move In And Enjoy: The work is complete, and you are the owner of a beautiful new home. You have probably built a ton of equity in a short time, and you did not have to engage in a bidding war to buy your ideal home. A 203k loan is a sub-type of the popular FHA loan, which is built from the ground up to help those who might not otherwise qualify for a mortgage. FHA’s flexibility makes 203k loan qualification drastically easier than for a typical construction loan. FICO: FHA allows credit scores down to 580, although some lenders might require a score of 620 – 640 to qualify for a 203k loan. Still, that is much lower than the 720+ you would probably need for a conventional construction loan. Down payment: $7,875 (3.5% of $225,000). You can receive 100% of your down payment requirement via a gift from family or approved non-profit organization. Debt Payments and Income, lenders will examine your debt to income ratio. This is the comparison of your income and debt payments. Typically, less than 43% of your income should go toward your proposed house payment plus all other debts. That is $430 in payments per $1,000 of before tax income. For example, if your income is $5,000 per month, your future house payment plus auto loan payments, student loan payments, and credit card bills should not exceed $2,150 per month. Loan amount: You can borrow up to 110% of the property’s proposed future value, or the home price plus repair costs, whichever is less. These loans are also subject to your region’s FHA loan limits. Occupancy: You must plan to live in the property you are buying. If you plan to fix and flip, the 203k loan is not for you. It is always wise to shop around and find the best lender. This is a rare exception where you might take a higher rate from a lender that does these all the time, rather than a low rate from an inexperienced lender. In the world of the 203k loan, contractors and lender experience is typically more of a consideration than cost.